Held “Ryoji Matsumiya personal exhibition” in Aomori City, Hirosaki City, and Goshogawara City. Built a Bizen-style climbing kiln with 8-cubic meter (about 282-cubic feet) capacity. ・Built a single chamber kiln with 2-cubic meter (about 70-cubic feet) capacity. ・Established Tsugaru Kanayama Pottery Inc. Started training potters. 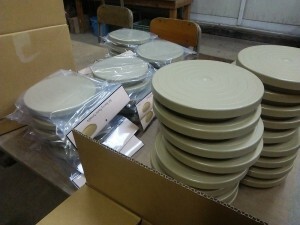 ・Established a three-month long, beginners’ course in pottery making for general pottery making devotees. In five years, 60 students completed the program. ・Built a Kanayama-style climbing kiln with 12-cubic meter (about 423-cubic feet) capacity. Built a single chamber kiln in July. Built a studio in August. Built a gallery in August. ・Submitted a work "Ash-glazed Big Jar" to the exhibition "Contemporary Japanese Ceramics" at Everson Museum of Art in New York, USA. The work became a permanent collection item. ・Built a Kanayama-style anagama with 4-cubic meter (about 141-cubic feet) capacity. ・Held "The First Summer Ceramics Festival." ・Donated a work “Object collaborated with Hiba(Thujopsis dolabrata)” to Goshogawara City Furusato Koryu Kenmin Center. ・Opened a shop in Aomori City and Ajigasawa town. Held “The first Tsugaru Kanayama Pottery group exhibition" in Goshogawara City. ・Built "Sound of Tsugaru" in the Tsugaru shamisen motif in Kanagi town, Ashino Park. ・Established Tsugaru Kanayama Pottery Guild. This is the first pottery makers' guild in Aomori Prefecture. ・Restored northernmost Sueki climbing kiln in Japan, "Kiku-no-sawa kiln." Successfully fired pots for the first time in Japan. The series of effort was broadcast by RAB as "Reviving Sueki – the sudden disappearance of the ancient technique”. ・Awarded the "The 6th Aogin Award" by Aomori Bank as recognition of Ryoji’s contribution to the new development of Traditional Crafts. ・Embarked on research on new pottery made from materials all produced in Aomori prefecture, using rhyolite produced in Aomori prefecture. ・Submitted works to "Tableware Festival" at Tokyo Dome for the first time from Tohoku area. Received great response from consumers and ceramic industries as authentic “Yakishime ware” around the metropolitan area. Continued to participate every year since then. ・Built a new 4-chambered climbing kiln with 8-cubic meter (about 282-cubic feet) capacity. Built a clay process facility for Kanayama clay. Installed a pressure slip-casting system. ・Organized "Aomori International Woodfire Festival 2002". 83 artists from all over the world participated. ・Invited Mr. Fred Olsen and built Olsen cross-fire kiln with him. There have been only six Olsen cross-fire kilns in the whole world, and only Tsugaru Kanayama Pottery has it in Japan. ・Installed a ceramic wall "Wind from Tsugaru" (9m long and 1.5m in width which is 317 feet long and 53 feet in width) at “Tachinebuta-no-yakata（a museum of “Nebuta）”. ・Hosted "Goshogawara International Woodfire Festival 2004”. 13 Potters from 7 countries participated in it for a month in artist in residence program. A ceramic wall "Wind from Tsugaru"
・Hosted "Goshogawara International Woodfire Festival 2005”. 18 Potters from 9 countries participated in it. Built Pizza and Bar-B-Que Oven at a café. Started making pizza workshop. Built two Sueki kilns in Maedanome, Goshogawara city. Displayed a work called “Shiawase-ni-kaeru” as mascot of Tsugaru Kanayama Pottery. *“Shiawase-ni-kaeru”, was made by Maro Kerassioti who has been an internationally famous Greek ceramic artist. Shown as the following picture, its shape is a frog. Shiawase-ni-kaeru means returning to happiness in Japanese. As you put your hand into a mouth of the frog, you will be able to return to the happiness. A movie, “Goju-no-To (a five-storied pagoda)” was shot at Tsugaru Kanayama Pottery site. ・A movie, “Goju-no-To(a five-storied pagoda)”, which Guts Ishimatsu was a leading man was shot at Tsugaru Kanayama Pottery site. ・Opened the Mediterranean restaurant “Patata”. ・Extended the Mediterranean restaurant “Patata”. ・Master Potter, Ryoji Matsumiya”, wrote a book about Tsugaru Kanayama Pottery and his philosophy and goals, "Clay, Fire, and Stubborn Guy." ・Reopened the Mediterranean restaurant “Patata”. ・Built an anagama kiln newly. ・Held an exhibition of works which first fired by the anagama kiln. ・Made “Enmei Jizo (life-prolonging stone statue)”. ・Donated “Enmei Jizo” to Choen temple. Reopened the restaurant “Patata” after extended construction. ・Dedicated “Komainu” (stone-carved guardian dogs at Shinto shrine) to both Takasawa temple in Ajigasawa town, Aomori prefecture and Daigakuin in Nara prefecture. ・Submitted works to "The 16th Tableware Festival" held at Tokyo Dome. ・Established Risako Noro on her own after six years’ training. ・Held "The Spring Ceramics Festival” during Golden Week (public holidays from April 29 through May 5). ・Submitted works to “Mashiko Ceramics Festival” in Tochigi prefecture. ・Held “The second whole Tsugaru Kanayama pottery exhibition” at Aomori branch of Ito Yokado department store in Aomori city. Held the exhibition of “Works using natural glaze of Hiba (Thujopsis dolabrata)at Shofu gallery (Shofu is master potter, Ryoji’s pottery name) . ・Held “The first Honoo-no-festival in Oku-Tsugaru” (honoo means flame, and Oku-Tsugaru means heart of Tsugaru area). ・Held “The Summer Ceramics Festival”. Continues to hold the festival every year since then. ・Held “The first Tsugaru Kanayama Pottery and Tsugaru lacquerware collaborated exhibition “at Aomori branch of Ito Yokado department store. The artist of Tsugaru lacquerware was Tsugumichi Matsuyama. ・Submitted works at the first time to “Nagoya Dome Pottery World in Nagoya Dome”. Dedicated “Komainu” (stone-carved guardian dogs at Shinto shrine). ・Held “ Shofu’s new works exhibition” by master potter, Ryoji. ・Held the first “The whole Tsugaru Kanayama Pottery exhibition” at Sendai Izumi branch of Ito Yokado department store. ・Built a salt kiln and fired during "Goshogawara International Woodfire Festival”. ・Held “The second “Honoo-no-festival in Oku-Tsugaru”. 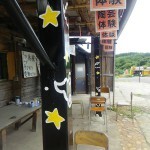 (honoo means flame, and Oku-Tsugaru means heart of Tsugaru area) in August.